When we say ‘eat like a champion’ we don’t mean stuff your face and win an all-you-can-eat competition, rather feel confident in the top quality food you’re putting in your body by dining at Toku. Free from additives and preservatives, we use the freshest fish, low-fat natural cold-pressed rapeseed oil for frying, filtered water and organic rice. We’ll help you treat your body like a temple so all you need to do is pick your medal! 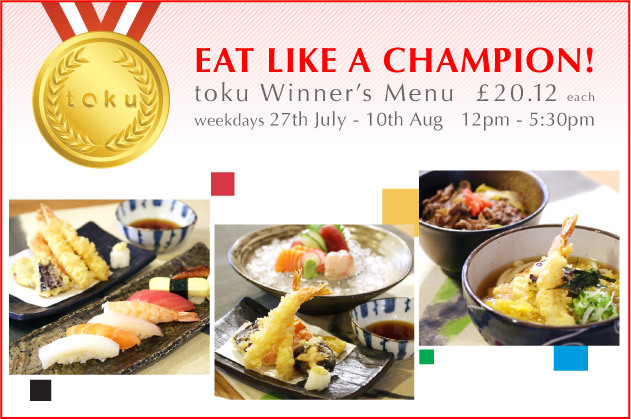 Available from 27th July – 12th August, priced at £20.12 per medal, Toku’s Medal Winner’s Menu is a delicious way to be part of The Games this summer, make sure you qualify by clicking on the relevant offer and booking online now!